PI184. 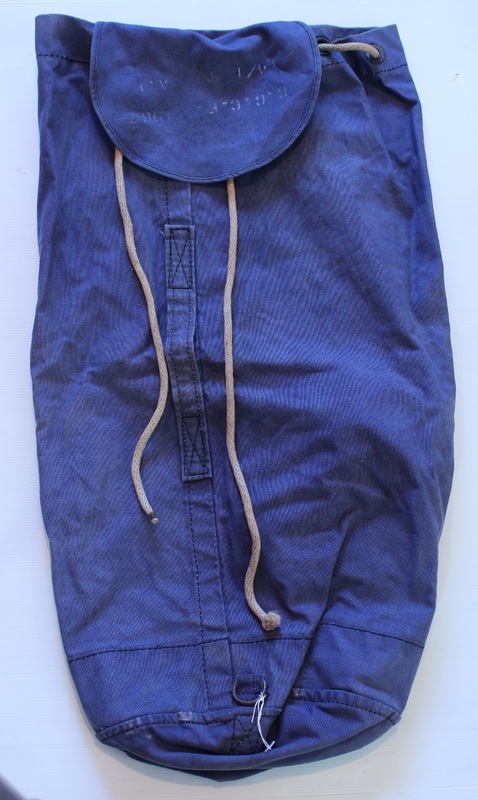 A blue kit bag stencilled in white “19938”. Joseph Ian McKee enlisted on 11 Dec 1940 at Melbourne and discharged with the rank of Leading Aircraftsman on 4 Dec 1944 from 1 Aircraft Depot. PI202. 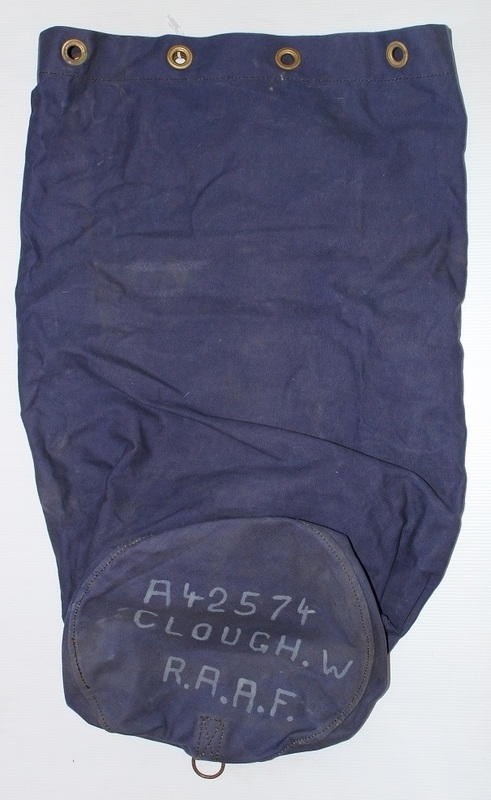 A blue kit bag stencilled in white A42574 CLOUGH W. RAAF. 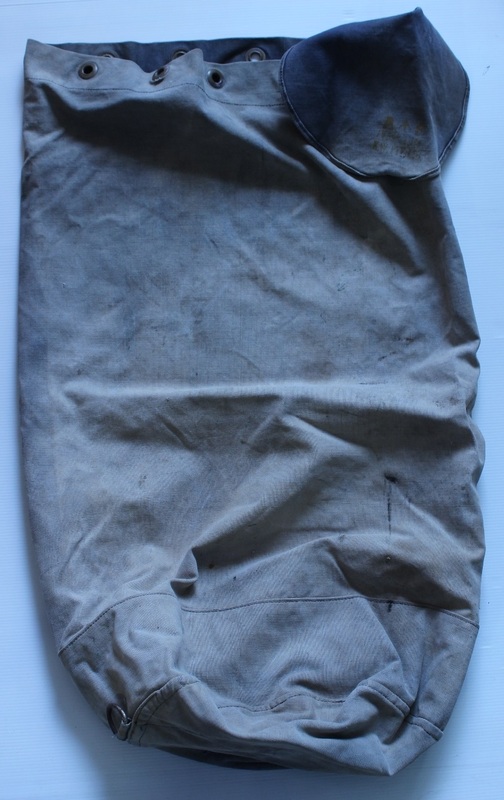 This is a post war kit bag. PI203. 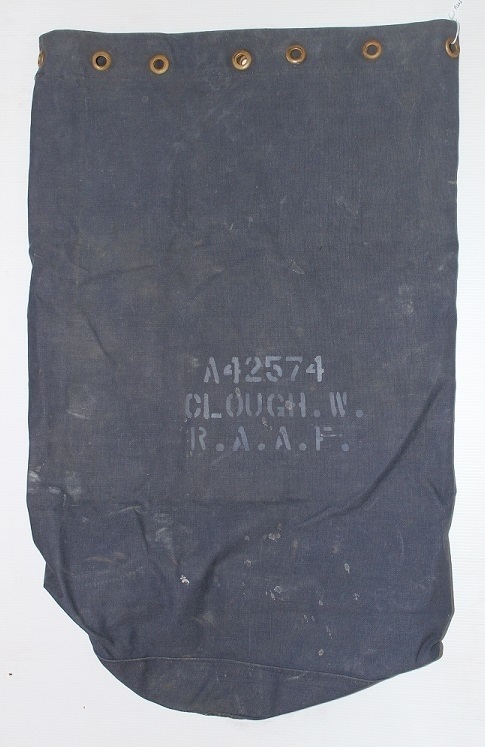 A blue kit bag stencilled in white A42574 CLOUGH W. RAAF. The flap is marked C.G.C.F. 1967 L4/1 arrow AF. 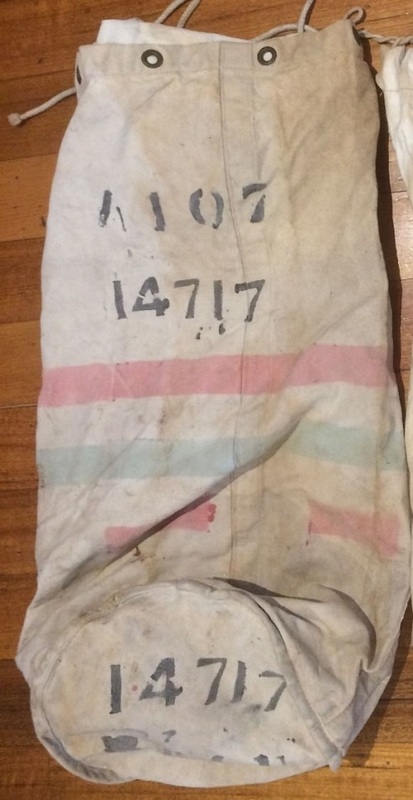 This is a post war kit bag. PI206. 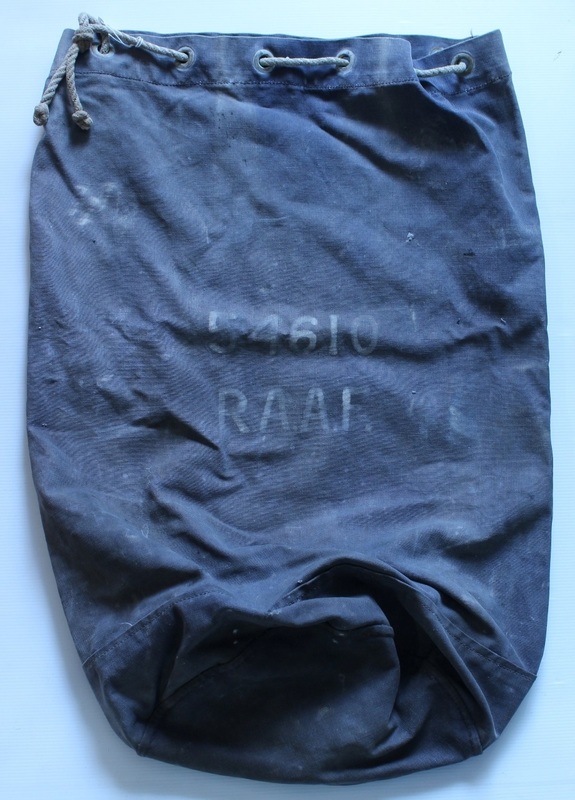 A black kit bag stencilled in white RAAF 38017. Patrick Joseph Anthony Devaney enlisted on 26 Feb 1941 at Perth and discharged with the rank of Sergeant on 15 Oct 1946 from DD&R Karrakatta. PI208. 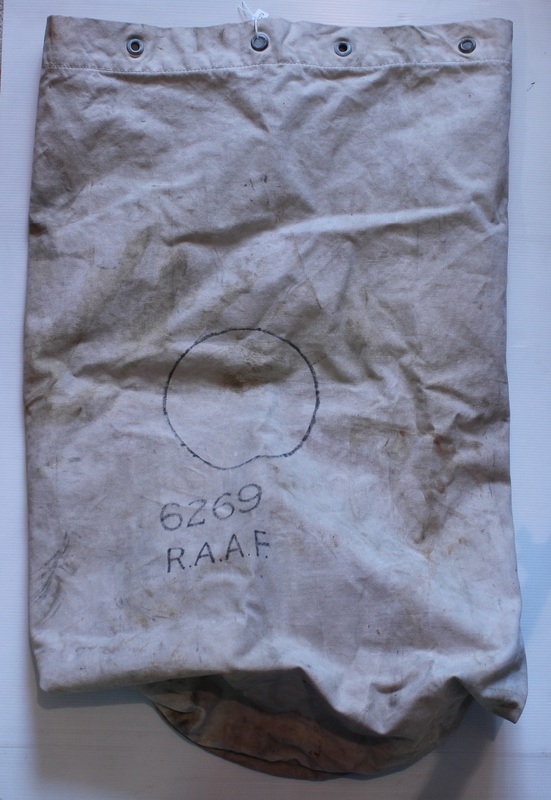 A black kit bag stencilled in white RAAF 116269. Reginald Albert Hooper enlisted on 14 Oct 1942 at Adelaide and discharged with the rank of Flying Officer on 27 Mar 1946 from RAAF HQ (D POSTS RECORDS). PI216. 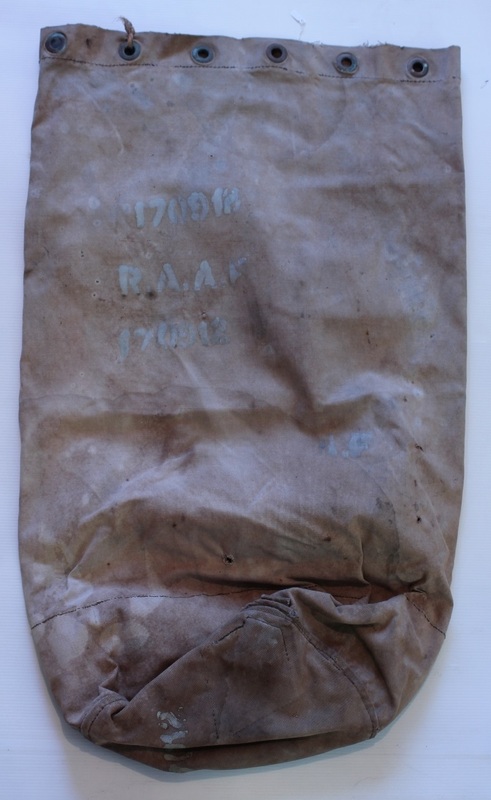 A tan kit bag stencilled in white 400883 G. Sharp RAAF VIC. 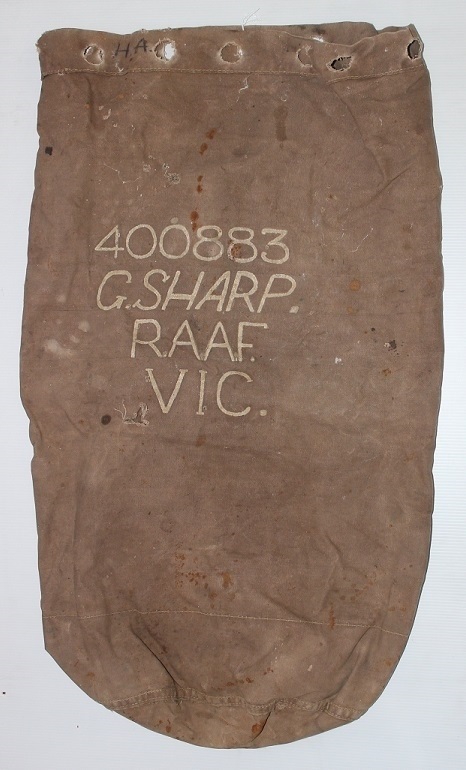 Gilbert Alfred Lawrence Sharp enlisted on 9 Nov 1940 at Melbourne and discharged with the rank of Warrant Officer on 21 Jan 1946 from 1 Medical Rehabilitation Unit. PI234. 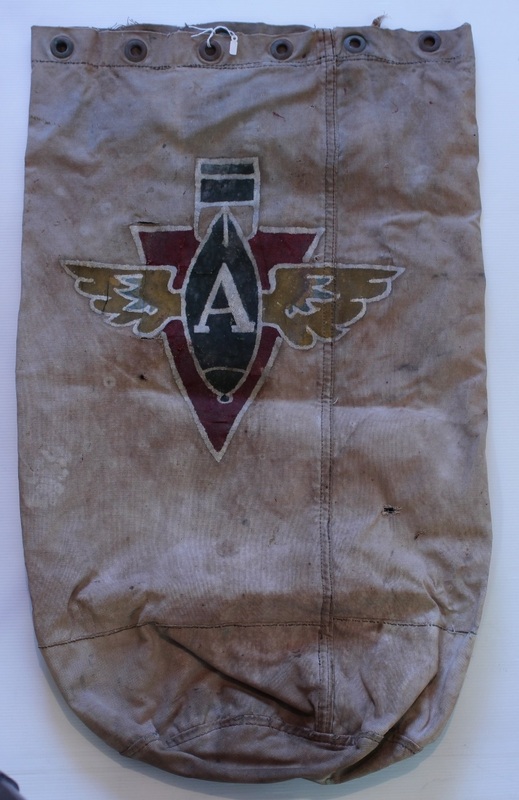 A white kit bag with a coloured stencil of a winged bomb on a red V. Robert Francis Philipson enlisted on 19 Oct 1944 at Brisbane and discharged with the rank of Leading Aircraftsman on 26 Feb 1946 from 3 Replenishing Centre. PI234. Back of kit bag. PI271. 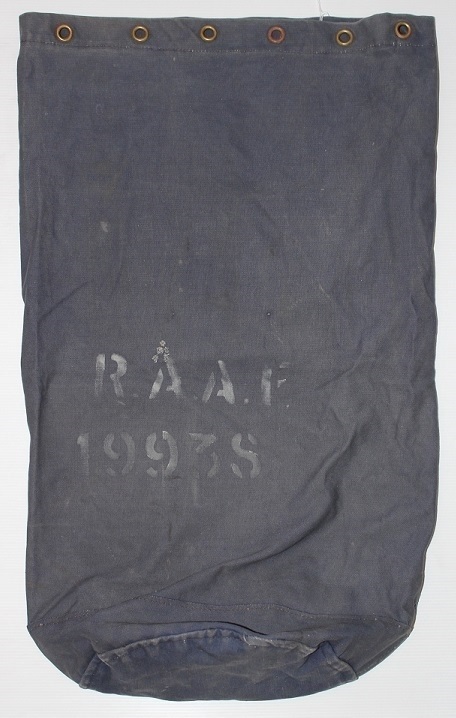 A blue kit bag stencilled in white RAAF 141786. Ronald Frederick Sawade enlisted on 14 Dec 1943 at Adelaide and discharged with the rank of Leading Aircraftsman on 6 Mar 1946 from 105 Fighter Control Unit. PI272. 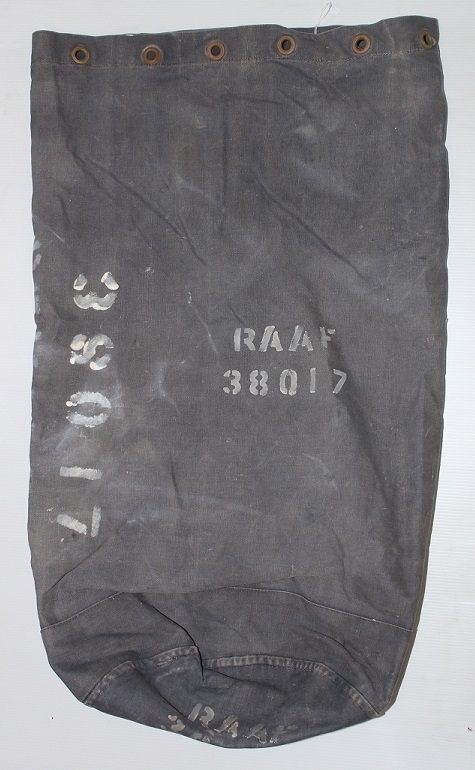 A white kit bag stencilled in black RAAF 6269. Eric George Baker enlisted on 20 Nov 1939 at Richmond and discharged with the rank of Warrant Officer on 28 Sep 1945 from 1 Reserve Personnel Pool. PI275. 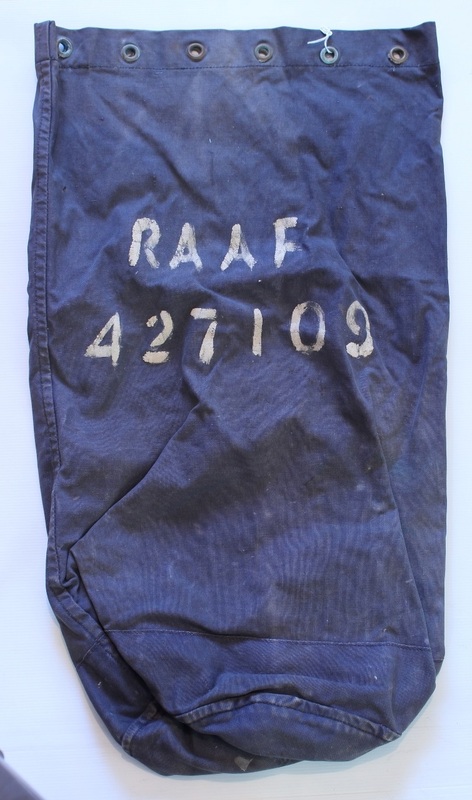 A blue kit bag stencilled in white RAAF 427109. Keith Frederick Wardle enlisted on 20 May 1942 at Perth and discharged with the rank of Warrant Officer on 4 Feb 1946 from 35 Squadron. PI289. 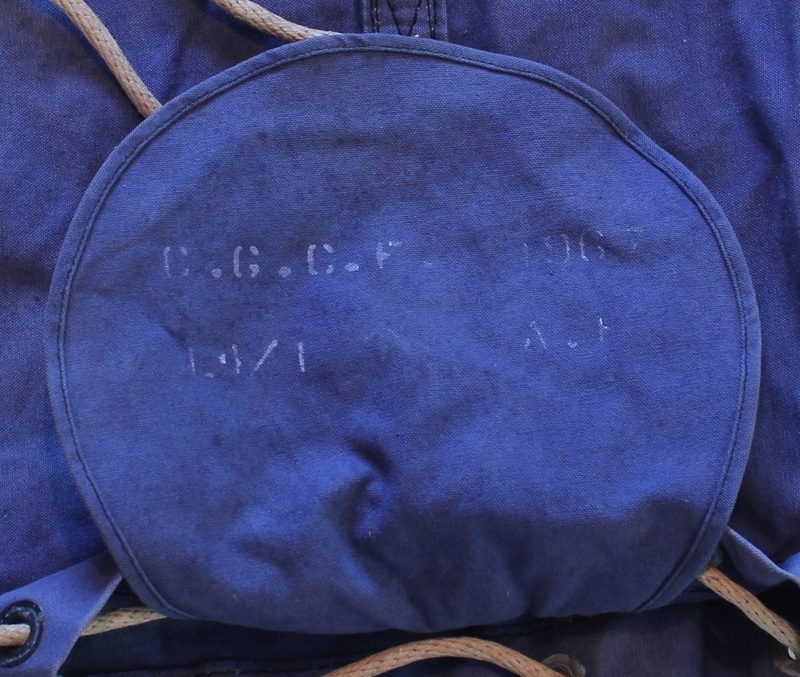 A blue kit bag stencilled in white under the flap C.G.C.F. A.F 1962. PI290. 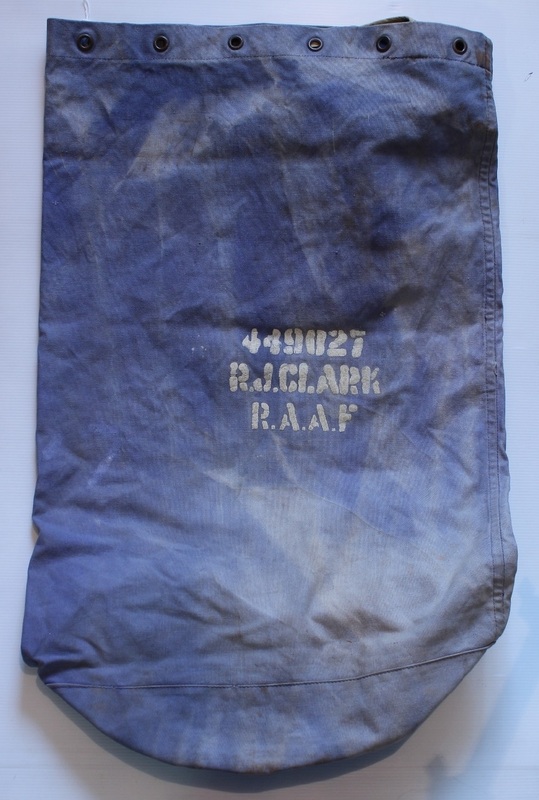 A blue kit bag stencilled in white 449027 R. J. CLARK RAAF. Robert John Francis Clark enlisted on 28 Jan 1944 at Sydney and discharged with the rank of Aircraftsman 1 on 13 Feb 1946 from AD HQ Darwin. PI291. 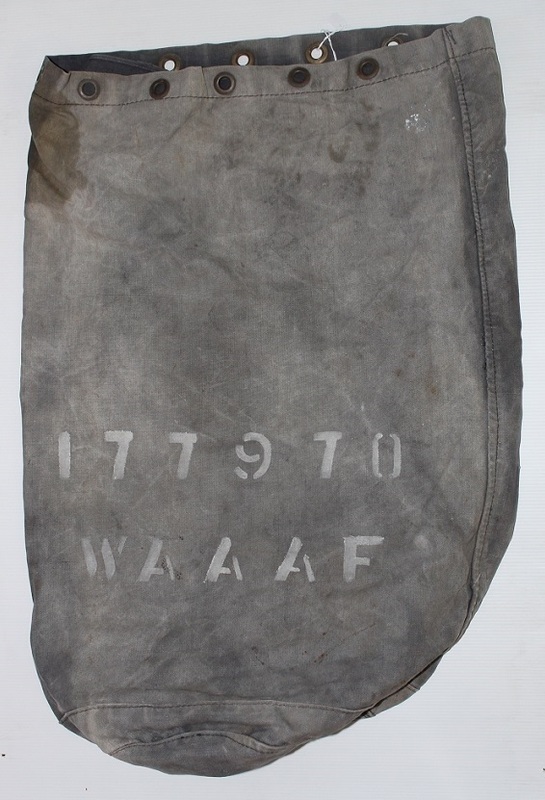 A black kit bag stencilled in white 177970 WAAAF. Mavis Annie Cross enlisted on 23 Mar 1945 at Sydney and discharged with the rank of Flight Officer on 5 Jul 1946 from 5 Medical Rehabilitation Centre. PI292. 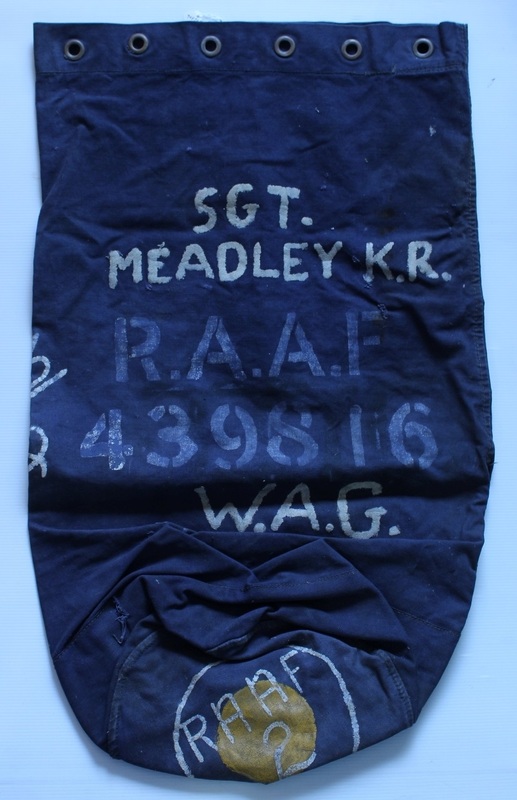 A blue kit bag stencilled in white SGT MEADLEY K RAAF 439816 WAG. Kenneth Robert Meadley enlisted on 31 Jul 1943 at Sydney and discharged with the rank of Warrant Officer on 13 Feb 1946 from 9 Aircrew Holding Unit. PI303. 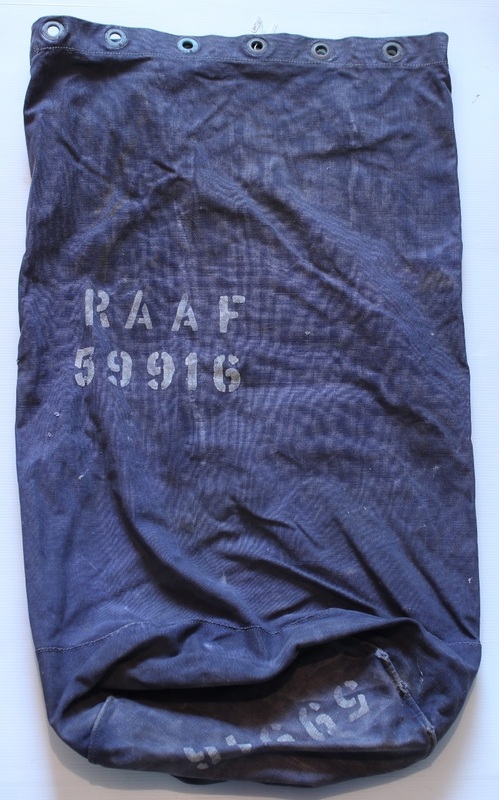 A blue kit bag stencilled in white “54610 RAAF”. Thomas Potter enlisted on 27 Apr 1942 at Melbourne and discharged with the rank of Corporal on 22 Mar 1946 from Air Defence Headquarters Townsville. PI306. 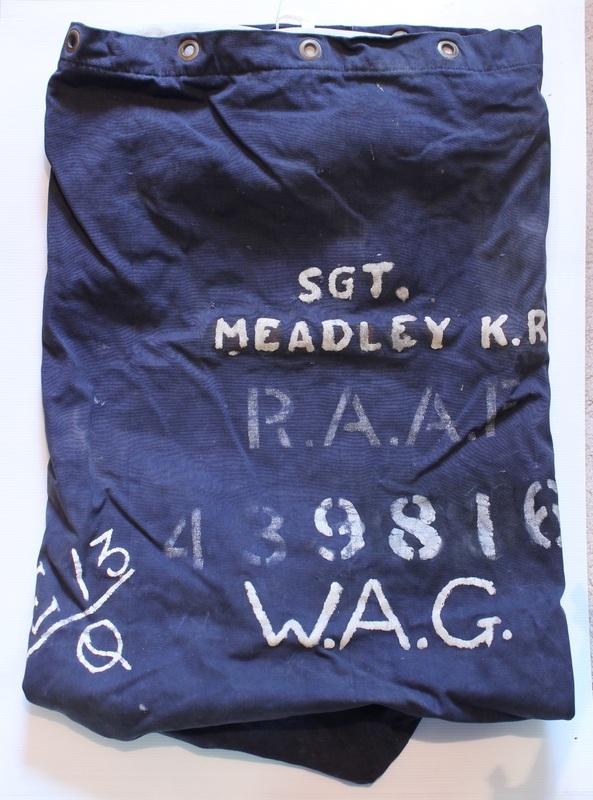 A blue kit bag stencilled in white “SGT MEADLEY K.R. 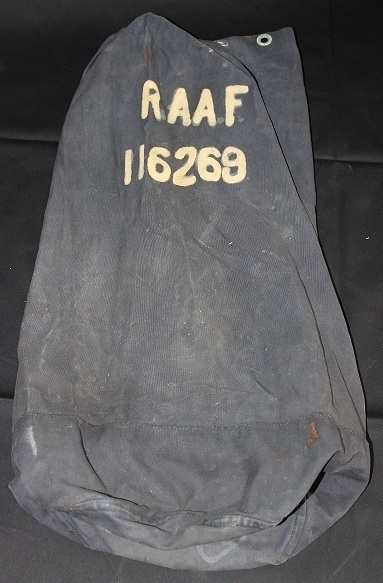 RAAF 439816 W.A.G. Kenneth Robert Meadley enlisted on 31 Jul 1943 at Sydney and discharged with the rank of Warrant Officer on 13 Feb 1946 from 9 Aircrew Holding Unit. PI307. A white kit bag stencilled in black “A107 14717”. Eric Arthur Wade enlisted on 29 Apr 1940 at Sydney and discharged with the rank of Corporal on 1 Nov 1945 from 102 Squadron. PI310. 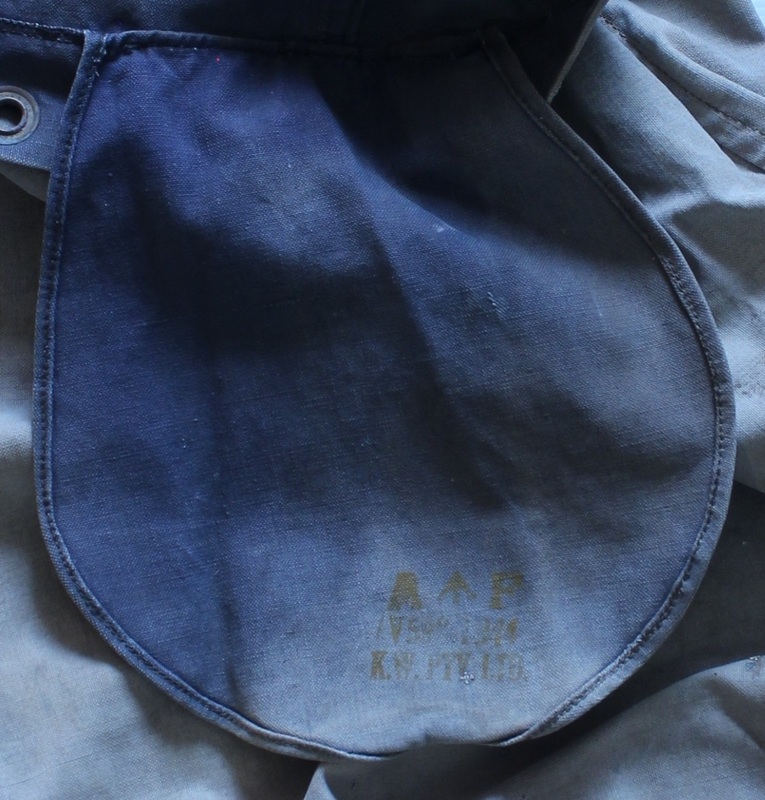 A very faded blue kit bag stencilled in yellow under the flap is “A arrow F.
PI310. A arrow F stencil under flap.